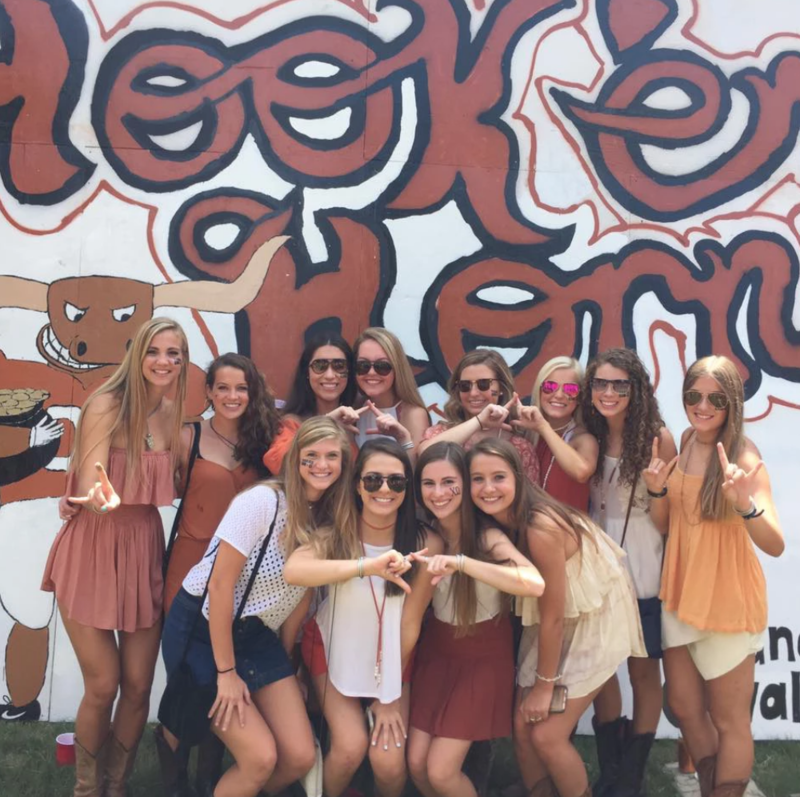 Out of all the universities in Texas, UT is one of the most notorious for its competitive sorority recruitment. If you’ve googled anything related to rush advice – you’ve probably noticed there are some pretty crazy rumors flying around. UT holds a special place in my heart because I myself went through recruitment there. I’ve experienced it firsthand as a nervous rushee, and then again and again as a recruitment officer. There, I learned everything there is to know about the ins and outs of UT’s recruitment process. Having been in your shoes, I completely understand what a crazy, stressful, and ultimately SO rewarding of a process sorority recruitment is at UT. Being part of such a special sisterhood is SO worth it, and I absolutely encourage you to join one. Here’s the thing: it’s also really intimidating for a lot of people. As a recent UT grad and a University of Texas sorority rush coach – I field a TON of questions from the ladies considering participating in recruitment. Below I’ve compiled a “Sorority Recruitment Roundup” of the most common questions I hear. Are the rumors true? Is sorority recruitment REALLY that competitive at UT? Yes, it’s very competitive. but not all the crazy rumors are true (example below on zip coding). 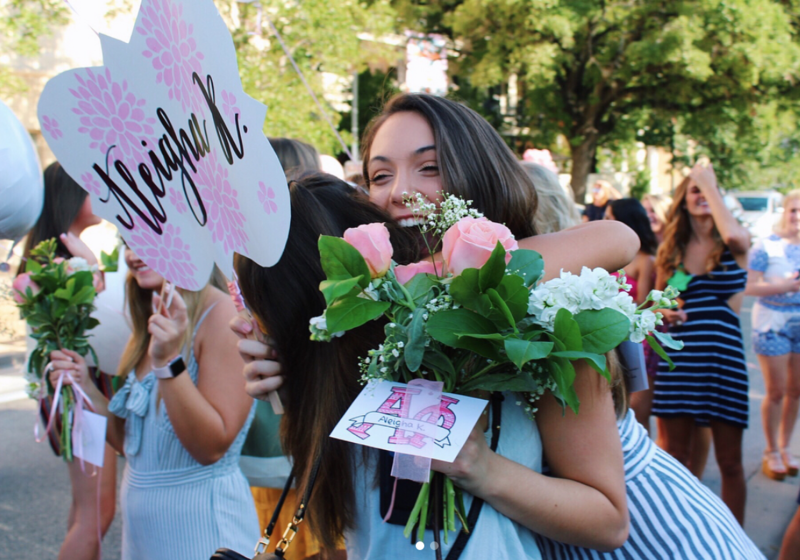 Every year about 1,400 ladies sign-up for sorority recruitment at UT, and the numbers continue to grow each year as more and more ladies see the value in sisterhood, philanthropy, and a home-away-from-home. There are usually only spots for about 900-1000 of these ladies, even with this past year’s pledge classes of about 60-80 ladies (varies by sorority chapter). Participation in formal recruitment does not guarantee ladies a bid, nor do rec letters. If a rushee still has houses on her card on Preference Round, it’s likely (but still not guaranteed) that she’ll receive a bid on bid day. Conversely, if a rushee is cut from all the houses prior to Preference Round, that’s it. Their only other option is a snap bid or to participate in the COB (continue open bidding) process after the fact, which again – does not guarantee a bid. There’s SO much pre-recruitment preparation that’s absolutely within your control that can maximize your chances of being invited back to more houses and finding a house you LOVE. There are many ways to make yourself stand out as a competitive candidate. Hiking in Heels helps mom-daughter duos with ALL of it. We’re super passionate about this because that’s why Hiking in Heels was started: the founder was SO tired of hearing about all these amazing, accomplished ladies she would have been thrilled to welcome to her sisterhood fell through the cracks and got dropped from everything. So she did something about it. She created a program that helps push girls from small towns, from out of state, ladies rushing as sophomores or upperclassmen, and girls from the big cities with lots of connections already – through the process and navigate their way to a sorority they’re SO excited to be a part of. 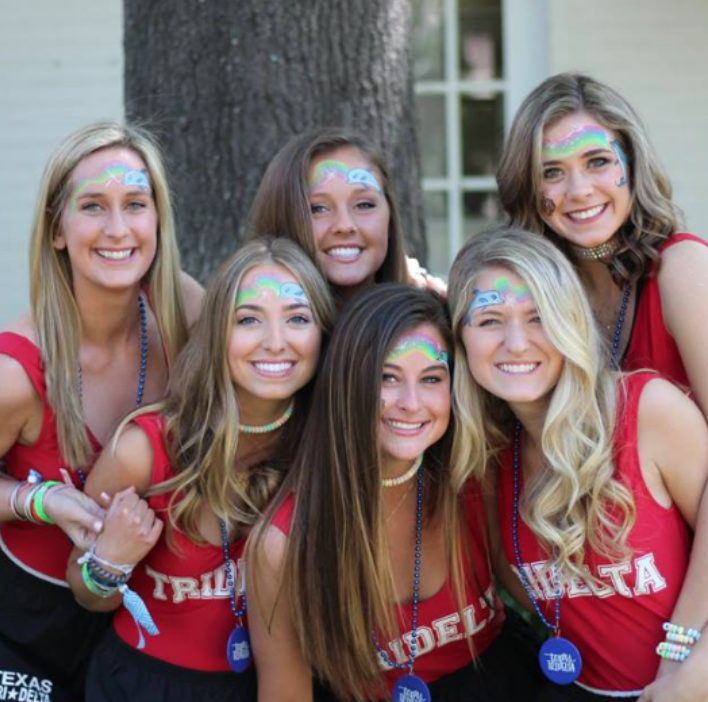 What are the top sorority houses at the University of Texas? There are 14 sorority chapters at the University of Texas. All the houses are really great. I’m not saying that to be politically correct! Since rush is so competitive at UT – many ladies participating in recruitment are thrilled to just get a house. They all have the beautiful houses, the sisterhood, the mixers, the fun campus-wide philanthropy events, the formals, and the cute matching t-shirts. They all get invited to the fraternity parties – including the TX-OU weekend. Of course, you probably heard about the “Big Six” or “Top 5.” This all stemmed from Texas Monthly article written in the 80’s. All the sororities at UT are so great – I encourage rushees to go in with an open mind. I’ve seen ladies pick and receive “top houses” when faced with the decision on pref night, but I’ve seen just as many ladies pref plenty of non-top houses as their #1 choice on pref night as well. It’s way more important to choose a house based on the girls you click with over a brand name. Now, with that being said, having a rush coach can help you maximize ALL your options, meaning if you want your pick of houses – whatever YOUR TOP houses are, hiring a professional consultant that specializes in UT rush can and will help you. Are the top sorority houses at UT listed on Greek Rank accurate? You go there hoping to find some useful information on the houses, and you leave horrified and often, more nervous than beforehand. It’s just a handful of people with nothing better to do trolling the rankings. What you should do instead: spend your time actually looking at the sorority houses here, getting to know the members, or visit their Instagram accounts for a more accurate picture. How can I make SURE I get a top sorority house at UT? Every rushee has googled “how to get into a top sorority house at UT” and poured over the articles for helpful advice. The honest answer is – no one can guarantee you a particular house, or a particular group of them (unless you have a sitting sister (meaning, actual older sister) in that sorority, at that chapter, at the moment you’re going through recruitment). Not a friend who’s a current, active sorority member, not an officer, not your mom’s friend who’s a chapter adviser, not anyone who’s donated a significant amount to the sorority, not your three older sisters and mom who all graduated from that particular chapter at UT, and not a rush coach. All of this helps but doesn’t guarantee anything. That’s why it’s so important to keep an open mind. I’ll say it again for the record: having a rush coach can help you maximize your options. If you want a particular house or set of houses, hiring a professional consultant that specializes in UT rush can and will help you more than submitting your materials and hoping for the best. Do Sororities Create Lists of “Top Girls” or “Top Rushees” they want ahead of time? Absolutely. Yes, this rumor is accurate. It’s impossible to really get to know someone from a brief fifteen-minute conversation over “what they did this summer” during Open House. The UT sororities start making lists of who they know coming through rush that fall as soon as spring semester rolls around. They also start building a list of legacies signed up for recruitment. They use a bunch of pre-recruitment paperwork to identify and score potential new members as well – sorority resumes, recommendation letters, Instagram – this list goes on. A large majority of girls they have their eye on is created long before recruitment ever takes place. If done correctly, there are a lot of things ladies can months before rush to maximize their chances of getting on that list! Interested in a free, private consultation? Fill out the form below and we’ll get back to you with answers. I heard the top sorority houses at UT zip code. What does that mean? Is it true? Rest easy! This rumor floats around every year. The sorority girls are way more concerned with attracting charismatic, accomplished ladies with killer grades and leadership skills than googling 1400+ girls zip codes over the summer. Here’s the bottom line: the recruitment team has more than enough rec letters to sort through, and TBH, they’d rather be spending time at the pool, getting a manicure, or doing anything else vs. googling girls zip codes. You should go do that too instead of worrying! Are letters of recommendation required at UT? Whether you call them Letters of Recommendation, Recruitment Information Forms, or Rec Letters, it’s essential to have them if you plan to participate in recruitment (competitively) at the University of Texas. Ignore anyone who tells you otherwise. PS – Current Greek actives are not allowed to write Letters of Recommendation on your behalf – only alumnae. Do the sorority recruitment teams at UT rank letters of recommendation? Yes! Not all letters of recommendation are created equal. Most sorority ladies (and alumnae) aren’t aware of this, but letters of recommendation are graded on a scale of 1-5 by the Director of Recruitment Records and Recruitment Team, based on several factors you have some control over. We work with all the ladies in our rush coaching program to make sure they’re getting the top rankings they’re entitled to vs. getting stuck with a lower ranking. Everyone who was accepted to the University of Texas seems to be so pretty and accomplished. How do I get an edge and stand out? It’s true! UT attracts some top-notch students. But we bet you’re every bit as talented and amazing. If you’re here reading this, you’re clearly doing your research and you’re off to a GREAT start! 2) Choose to work with a sorority rush coach to help prepare them for and guide them through recruitment. Having a trusted advisor helps ladies navigate the process with so much more confidence and success – especially so in a competitive environment such as the University of Texas! Where are the best places to live if I plan to rush and join a sorority at the University of Texas? Covered! Check out our Where to Live if You Plan to Join a Sorority at the University of Texas blog. Do the UT sororities host summer rush parties prior to formal recruitment in the fall? How do I get invited? Yes. And no. There are a lot of terms for this: summer rush, rush dates, dirty rush, pre-rush, pre-recruitment parties, etc. It’s all the same thing: a member of the sorority reaches out to you before formal recruitment and invites you to a chapter sanctioned event OR a low-key event with a few close sisters. This could be anything from a RoundUp event, a fraternity party, a frozen yogurt outing, one-on-one coffee date, a dinner party, a karaoke event, swim party, or even an all-day party barge on Lake Austin. (These are all actual examples of events that sororities have planned.) Regardless of the activity, it’s their way of getting to know you better before recruitment, since recruitment week doesn’t allow for much time! Back to the yes and no. Since not all “pre-rush” events are sanctioned by UT (aka summer rush is against the rules), some sororities will be hosting events, and others will not. It completely depends on the year, the chapter, the recruitment team, and the chapter adviser. Just because a few sororities reached out to you and others didn’t – it doesn’t mean you were excluded. They might not have any pre-recruitment events planned. RoundUp is a HUGE annual Greek event with weekend-long events that take place at the end of March from a Thursday-Sunday. All the fraternities fly in rappers or country bands, host crawfish boils, and invite all the sororities to join them in the fun. UT requires college students show their IDs and collect wristbands on campus to discourage high schoolers from participating in the fraternity parties. All the sororities order matching neon-colored tanks, tube socks, fanny packs, and a bunch of branded accessories to show their chapter’s pride. Most of the sororities at UT host various RoundUp events at their houses supporting their philanthropies. This is often when the earliest pre-recruitment aka “dirty rush” events begin. Sororities invite prospective new members of their choosing to visit their house, participate in the events they have planned (like a backyard BBQ, for example), and socialize with the current members. Sororities support each other by visiting each other’s philanthropy events as well. How will my legacy status (legacy or non-legacy) affect my chances during sorority rush at UT? Most chapters define legacy as a sister, daughter, or grandmother (or step-sister, step-daughter, etc.) of a Greek member. While a legacy is not a guaranteed “in” by any means, chapters do give legacies extra consideration. 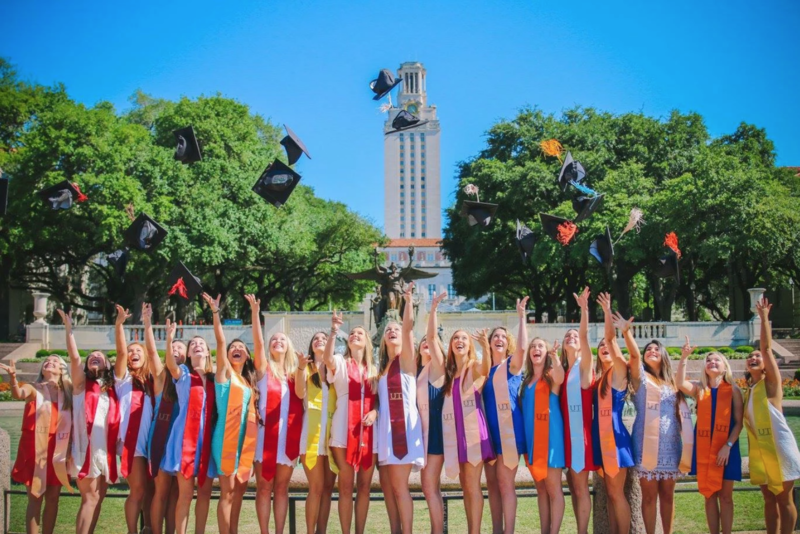 Older universities with sororities that have been around for years like UT have TONS of legacies going through each year – enough to comprise entire pledge classes without letting anyone else in, so it would be unfair to non-legacies to take them all, as wonderful as they may be! Each sorority votes to take a specific percentage of legacies participating in recruitment who meet the chapters qualifications (think chapter-specific GPA minimum requirements, leadership skills, or philanthropic achievements). The sororities also have some standard rules and guidelines around when a legacy can be released from recruitment. Another sticky situation, and unfortunately, true rumor about UT sorority recruitment is legacies going through and getting cross-cut. We won’t address that in too much detail here as that makes for a more helpful conversation when we know your specific situation. What are some useful or surprising sorority rush tips that most rushees aren’t aware of during recruitment? Watches and handshakes are no-no’s. While UT sororities take these rules a little more seriously than other schools, this is still a great tip regardless of which school you plan to attend. Here’s why: as cute as your rose gold apple watch may be, or as curious as to how many calories your Fitbit will say you burned walking from house to house during recruitment, it’s best to leave anything that tells time at home. It’s easy to get in the habit of fidgeting with your watch or checking the time when you’re nervous (and let’s face it – it’s hard not to be nervous during recruitment!). Although you may have the very best intentions for checking the time (aka – I love this house so much. How much time do I have left at this party to make a good impression? ), it can come across as “she’s uninterested” or “she’s just counting down the seconds until she can leave.” That’s the last thing you want the ladies in that house to think! Handshakes during recruitment can be awkward: the rushee is trying to balance her water bottle, everyone’s hot and sweaty because well, it’s Texas, and nerves are high! Have you ever had a weak or odd handshake experience? Of course – we all have. For active members, recruitment is all about making every potential new member (PNM) feel welcome and at home. Adding in handshakes is just one little potential dose of unnecessary awkwardness. So most sororities at UT just toss it out and advise their members accordingly. What is the most stressful thing about sorority rush at UT? A lot of ladies are intimidated by the rumors and conflicting information found online outlining what to do and what not to do. Other mom-daughter duos find it challenging to prepare their materials correctly. Some ladies find it overwhelming to track down so many alumnae to write their letters of recommendation on their behalf. Regardless, you’re not alone! Everyone’s doing their best to prepare. If you want the peace of mind that you’re preparing everything correctly to send to the alumni to complete these on your behalf – just reach out – we’ll help you! What is the BEST thing about choosing to participate in sorority recruitment at UT? The sisterhood, the life-long friendships, the network after graduating, and the incredible college memories that will last a lifetime are all great reasons! So are the philanthropy events, the leadership skills you’ll take away from officer positions, the scholarships available to Greek members, the home-away-from-home, and the colorful greek t-shirts. 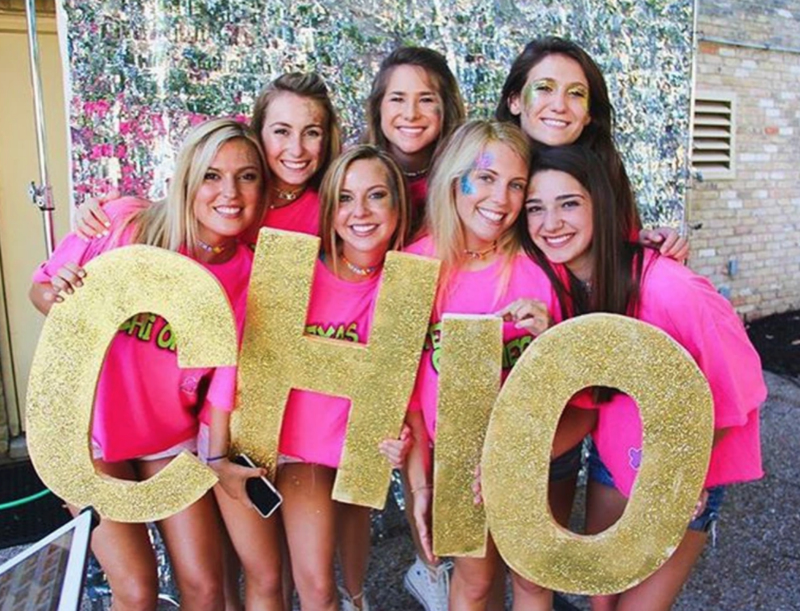 If you’re considering joining a sorority at UT – go for it! Are there spots for all the girls that signed up to rush at UT? The short answer is no, participation in sorority recruitment at UT does not guarantee or entitle you a bid. Circle back to the very first question addressed in this blog for the most helpful, detailed explanation. 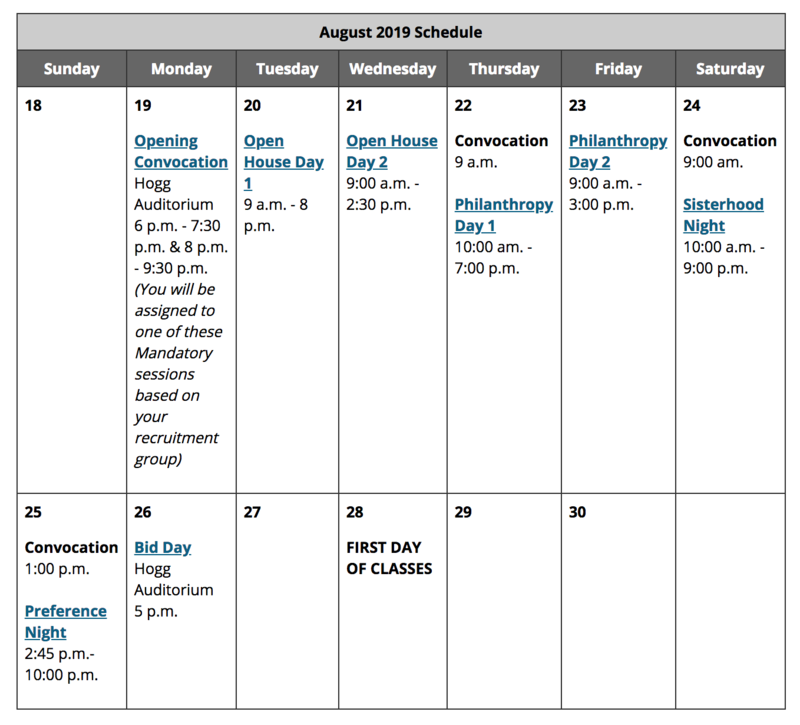 What does the UT sorority recruitment schedule look like? 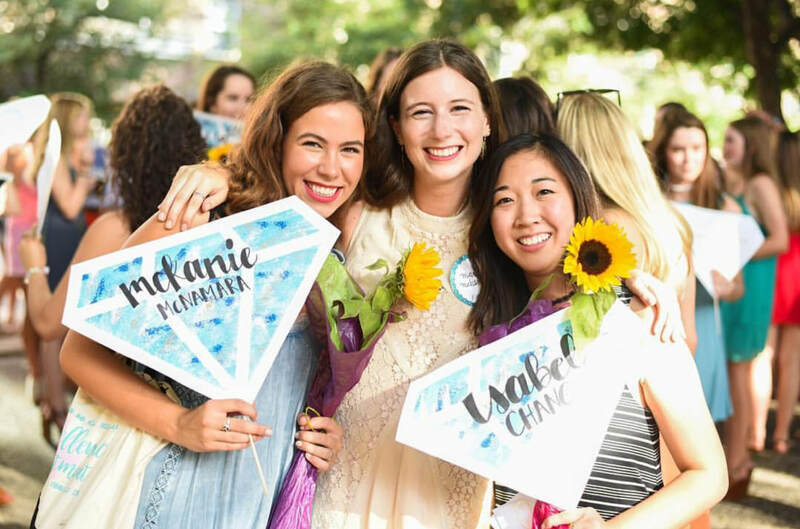 UT Sorority Recruitment consists of a 2-hour mandatory orientation the evening before, 2 days of Open House Events, 2 days of Philanthropy Parties, 1 day of Sisterhood Parties, and Preference Night – followed by Bid Day. Read our blog for a list of the chapters with links to their official websites, and for a link to our page with photos of each chapter’s sorority house (taken by Hiking in Heels). What are the most common questions the girls in your program ask you about sorority recruitment at UT? “I’m a transfer student who plans to participate in sorority recruitment. What should I be aware of? We’ll have some sorority-authored content soon so you can hear directly from the girls – specifically, what the ladies say about why they are obsessed with their sorority-home and sisters. Stay tuned! Yes!! Just because you’re a transfer, sophomore, or a junior rushee, doesn’t mean you can’t have a FANTASTIC recruitment experience at UT! We’ll make sure we help you position yourself competitively and give you the edge in every way possible. What are the pros and cons of rushing as a sophomore at UT? Participating in sorority rush as a sophomore has way more pros than cons. And you’re NOT alone – many ladies choose to participate in sophomore year for different reasons. UT has a sophomore quota, meaning houses are encouraged to offer bids to a specific number of sophomores each year or incur a fine. This helps make additional space for sophomore rushees. Participating in recruitment as a sophomore also gives you a chance to network and make friends with sorority members your freshmen year – connections which will definitely help you when recruitment rolls around. You never know – your best friends, study partners, or pot-luck freshmen year roommates might become your new sisters. 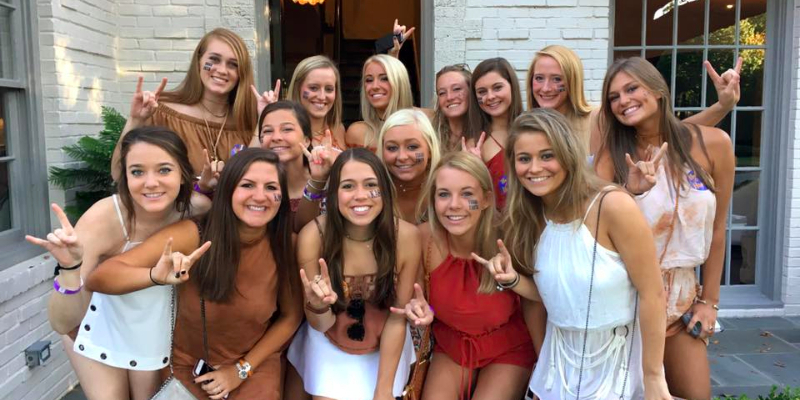 If I plan to participate in sorority rush at the University of Texas, will working with a sorority rush coach give me (or my daughter) an edge over other rushees? Planning to rush? Consider working the first and only sorority rush coaching program in Texas (and the first of its kind in the nation). Absolutely. A lot of the big decisions surrounding recruitment involve paperwork and are made by the chapters months before recruitment officially begins. That’s great news for you – especially since you’re already here. If I work with a sorority rush coach – can it be kept confidential? Yes ma’am. All Hiking in Heels clients are anonymous until if/when they choose not to be. Of course, numerous references from happy families are available upon request. To learn more about working with a sorority rush coach – read our What’s a sorority rush coach, and should you partner with one if your daughter is participating in sorority recruitment? blog. My daughter plans to participate in sorority recruitment. How do we apply for the program? How soon should we apply? To apply for the Hiking in Heels program, which was nationally recognized in Cosmopolitan Magazine, call us at (512) 827-7586 or fill out the form below to request a free, private consultation and ask any questions you may have.